Do you need a weighing option that is ideal for drums up to 2,500 lbs.? Floor Scales Direct offers floor scales that are specifically designed for industrial applications. We are proud to offer drum scales that are ready to use upon delivery. Our drum scales ship with everything that you need to start weighing today! You can expect reliability and the highest quality workmanship when you purchase a drum scale from Floor Scales Direct. Accuracy – Our drum scales are factory calibrated for maximum precision. Durability – We use high quality, diamond plated steel for the top deck. NTEP Approved – Indicators used on drum scales are NTEP approved and legal for trade. Easy to Use – Self leveling feet, built-in overload protection, and compact design make it easy to weigh drums and other industrial materials. Versatility – A watertight junction box and watertight, steel, nickel plated load cells make our drum scales suitable for almost any environment. Customer satisfaction is our highest priority. 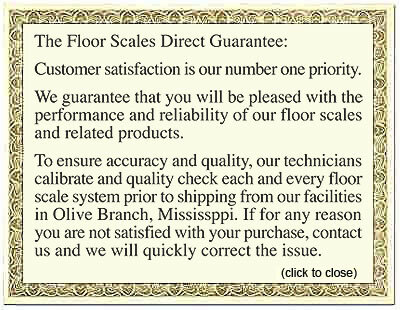 Our technicians calibrate and inspect all of our floor scales for quality before they leave our Olive Branch, Mississippi location. We ensure reliability and performance. Look no further than Floor Scales Direct for the right scales and superior customer service.